Pangkak lives on in Angon-Angon, a village on the island of Kangean in the Kangean Archipelago, a remote sprinkling of islands a hundred kilometers east of Madura, adrift in the Java Sea. The people in this far-flung archipelago call themselves Orang Kangean or Kangeanese, with strong cultural links not only with the Madurese to the west in Madura and East Java, but also to the sea-faring tribes of Sulawesi to the east: the Bugis, Mandar, and Bajo people who have been casting ashore for centuries. The Madurese connection is deepest: the Kangean language is almost a dialect of Madurese, and the arts of Kangean show clear ancestral links to those of Madura and Java. The a capella singing style called pangkak is in many ways unlike anything that I’ve ever heard, featuring a busy polyphonic style that is at once loose and remarkably complex. Male singers take turns imitating gendhang drums (“dum tak, dum dum tak”), unspooling long, vocable-filled solos, and making their way through a round-like structure which seems to mutate with each revolution. While singing in nearby Java and Madura is most famously heard in combination with instrumental ensembles like gamelan, those areas also have similar, equally obscure a capella traditions. Pangkak’s proto-beatboxing and gong-like vocal sound effects (“Telelelele!”), for instance, remind me of the incredible “vocal gamelan” from Banyumas, Central Java called jemblung. Jemblung is a theatrical a capella format where a quartet of actor-singers sit around a table and imitate the various sounds of the gamelan percussion ensemble with their mouths, complete with an earthy humor also found throughout pangkak. As the legend himself Philip Yampolsky wrote in his liner notes to the jemblung-featuring Music of Indonesia, Vol. 14, “vocal gamelan-imitations” are widespread across this corner of Indonesia. Bali and Lombok have the twin styles of cakepung (in Karengasem, East Java) and cepung (In West Lombok, now almost extinct.) The East Balinese cakepung style itself led to the modern, quite popular artform called genjek, where youth in Karengasem get tipsy on tuak palm wine and sit in a circle, loosely imitating gamelan melodies while swaying boozily to the beat. Even Bali’s famous kecak tradition may be a considered a musical cousin (and is cited as such by people in Kangean): its interlocking vocal parts may not explicitly imitate a certain instrument but are surely inspired by the kotekan hocketing technique so famously found in Balinese gamelan. Yampolsky also helpfully points towards some fabulous recordings made by famed Kiwi composer and ethnomusicologist Jack Body. In his wonderful album Jemblung: Narrative Traditions of Java, Body shared a continuum of vocal traditions including macapat singing from Pekalongan (in north central Java) and memaca (from Sampang in Madura.) Both styles (and the cepung/cakepung traditions of Bali and Lombok, too!) are rooted in the ancient Javanese poetry called macapat, often written on old lontar scrolls and recited/sung by a group of men. Both of these Body recordings start with a sound reminiscent of the gerong male chorus that sings with gamelan in Java and Madura, but each erupts towards the end into a joyous swarm of singing which does seem, as Yampolsky points out, to imitate the gamelan form, if not the individual instruments. Referrents run in both directions: legendary Javanese ethnomusicologist Sumarsam has theorized that these choral macapat traditions are what led to the use of gerong choruses in Central Javanese gamelan. This means that macapat-inspired choral sounds came to fill the gamelan tradition just as gamelan-inspired sounds sometimes emerge in these macapat traditions! Before I finish threshing out this choral family tree, there’s one more tradition to note: the gumbek ritual chant of Sampang, Madura. Jack Body shared his recording of gumbek on Music of Madura, a long out-of-print (and frustratingly hard to find) album compiling the music of that island. I haven’t heard the recording, but luckily gumbek is still around: you can see videos of the ritual in action on YouTube. In this annual ritual, young men and old gather with sacred heirloom spears and dance with them in a circle while singing a cyclical chant. The chant, actually just one looping melody, is pretty simple compared to the florid structure of pangkak, but I see a link elsewhere. Both styles are rooted in annual ritual and are centered around a circle dance. Ritual circle dances are common in other parts of Indonesia like East Nusa Tenggara (remember the bei mau song and dance of Timor) and Sulawesi, but are now almost non-existent in the Javasphere. 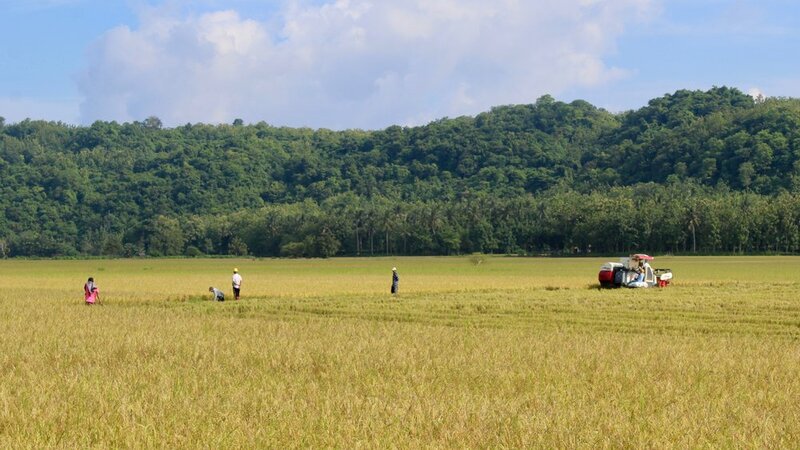 Rice is now harvested by machine in Kangean. In practice, though, these parts seem to be looser: I recorded the same piece twice and found a pretty different structure each time, with pieces locking in place in different ways, some sections extended, others cut short. This already complex puzzle may even be incomplete, as there should have been twice as many singers, though it's unclear whether that means there would be twice as many parts! Pangkak has a handful of songs which seem to form its own special repertoire. Some, like "Lambhereng," can be sung with a smaller group of singers, while others, like "Pojian," "Kartem," and "Totteng" may require the full group of 12+ men, with even more vocal parts. These titles often have a story themselves which is unrelated to the poetic texts within. "Lambhereng," for example, had quite an unusual one: "Two orphans are sent off by their stepmother to tend to their goats in the field. The stepmother gives them a package of food wrapped up in betel nut leaf, and off they go. Only later did they open the package to find not food but...poop. The orphans cried." That's it, that's the story. The evil stepmother is unsurprising, but what's the moral exactly? Nobody could explain, but we had a laugh. Villagers in Angon Angon still perform pangkak during an annual harvest ceremony (also called pangkak) and for other village celebrations like Independence Day festivities. In the past century, though, pangkak was in danger of disappearing as agricultural practices changed. The pangkak ritual was deeply tied to the old-fashioned method of harvesting rice by hand: as it was tough work, the whole village would gather together, with women harvesting the rice as men danced and sang. Starting in the late 20th century, this hand harvesting tradition began to be replaced by machines, making harvest vastly easier but also destroying the traditional context in which pangkak thrived. The tradition is not yet gone, though: the village chief of Angon Angon sees the power and importance in traditions like pangkak, and is refusing to let it slip away so easily. He’s begun arranging weekly practice sessions, letting the older generation refamiliarize themselves with the material and hopefully exposing curious youth to this deeply rooted practice. Three years after the video is uploaded, a voice of hope arises in the comments: “Sebenarnya belum punah…hanya saja pangkak ini di adakan di acara2 tertentu.” “Actually, it is not yet gone…it’s only performed for special events.” What a wonderful thing to see, the usually toxic space of the YouTube comment section transformed into a place of affirmation and hope! But how could we know for sure? The internet, at least, was still devoid of any real proof…no recordings, no videos, even amateur YouTube ones. I’d have to go find out for myself. People in Madura were perplexed when I told them my plan to go to Kangean. “It’s so far!,” they’d say. What could you possibly find there? The Madurese were almost completely ignorant about their cousins across the Java sea and the musical treasures they maintained. Mentions of pangkak were met with blank stares. They were right about one thing: the Kangean islands are far, more than a hundred kilometers from Madura’s far eastern port of Kalianget. Lucky for me, there’s now a “fastboat,” a speedy ferry which can zoom you over to the archipelago in less than four hours, a blink of the eye when it comes to maritime travel in Indonesia. I expected a rough journey, but it was literally smooth sailing! I napped most of the way there, waking up occasionally to have a look out the window at an endless horizon unbroken by land. After a good snooze, I emerged from the ship’s interior to take in Kangean, a flat expanse of mangrove broken up by low limestone cliffs. The harbor was abuzz with porters, motorcycle taxis, and waiting family members, all mobbing us at once as we stepped off the boat. Luckily, I had made some connections there already: Pak Mudakkir, a friend of a friend and retired civil servant, met me at the harbor, welcoming me with amusement and introducing me to his nephew Rahman, a very tall, gaunt young man with a fine moustache and intense cheekbones. Rahman helps me transcribe some lyrics at the recording session. It was Rahman who introduced me to the village head of Angon-Angon, who in turn informed us that I was in luck: they’d recently begun having a weekly pangkak practice every Saturday night! Not only was pangkak alive and well, but I wouldn’t have to ask people to go out of their way so I could hear it for myself. The weekly rehearsal was held at the local bale desa or community center, an open pavilion in the middle of some soon-to-be-harvested rice paddies. We were greeted by the village chief and a handful of singers who had arrived early, older men with wise, wrinkled eyes and gap-toothed smiles. The village chief told the origin story of the cave and the jinn as dozens of bugs swarmed around us, drawn from the paddies into the space by the flickering blaze of fluorescent lights. The whole gang couldn’t make it that night, the singers explained, which was a shame: the pangkak sound wasn’t truly complete until you had around a dozen men. We soon had half that, which would have to do. We set up to shoot video first: I placed my ZOOM recorder on a tripod in the middle of the pavilion’s tiled expanse and asked the men to dance around it. It would be odd if I too were in the circle so I watched and filmed from just outside, following the men as they slowly circled my recorder like a holy relic, flying insects zipping through the air. The music was even better than what I’d seen on that nearly forty-year old video. Even as melodies looped cyclically across the performance’s ten-plus minutes, the structure of the musician’s parts seemed to be constantly shifting. The cohesion of these many parts - the drum imitation, the vocal interjections, the one solo melody - would seem close to falling apart, only for the whole gang to reconvene, their voices coming together as one for a spirited refrain. After a gong-like “telelele” from one of the members, the cycle would begin again, each time different from the one before it. The men looked great in their black suits, complete with the famous Madurese red and white striped shirt. As the song progressed, the rhythm slowly ramped up and the men became more animated, gliding their hands threw the air and throwing them up to the sky during expressive solos. From an audio standpoint, the performance had some hiccups - somebody ran into the tripod at one point, and each singer seemed to take turns coughing throughout it, as if in rounds. After a break, the men agreed to sing again, this time “buat rekaman aja” - just for the recording. I learned my lesson from the couching fits, supplying each singer with a cup of water and asking that they stealthily take a sip if they felt themselves getting raspy. The circle formation wouldn’t be ideal, either, so I asked that they sit in a U-formation, with my recorder centered so as to pick up a balanced sound. It must have been odd, singing on the floor when they were so used to dancing in formation, circling an empty space. The vibe was still great, though, with the singers loose and smiley, a gang of neighbors crouching behind me and filming the whole scene with their cameraphones. Great, I thought. More proof: pangkak’s not dead. It’s alive and well in Kangean. Come harvest time, these joyous voices will rise up for the countless time, filling the fields as they have for so long. Special thanks to Rahman and Bak Mudakkir for their generosity and hospitality during my stay in Kangean.